S3E03 - "Too Many Pinkie Pies" - mlp (my little pony) - Furtopia | Family Friendly Furry Forum and IRC Chat! S3E03 - "Too Many Pinkie Pies"
Mister Anderson! Surprised to see me? Well the Pinkie episode was pretty cool! Though I was naturally a bit disappointed the clones were flatter characters than the original. It made sense because the other Pinkies were essentially Pinkie but without her memories. Their love of fun had not yet been tempered by experience. However, one would hope they could have learned. And, if you could copy a friend you love, wouldn't you? It occurs to me that from now on there's always the possibility that one copy was missed. Anyone else notice that Pinky Pie (the real one) has been breaking the 4th wall so much that the others are starting to notice? Like her slow decent into the water when RD was trying to snooze and she asked how Pinky did that. This episode had me laughing the whole time, but that's to be expected of Pinky Pie. I'm really interested in my daughter's reaction because Pinky is her favorite pony, and she's only 3. Amazing the speed of fandoms. Re: Season 3 Ep.3 - "Too Many Pinkie Pies"
I have mixed feelings on this episode. First of all, seeing pinke pie's second emotion (She's very binary when it comes to emotions...) is always Interesting. ^_^ It adds a small amount of depth to the character. We got to see the return of wingless Dash. She's reading again. Tank showed up again (i was begining to think they'd forgoten about him.) Overall I enjoyed the episode. What I didn't like, however, was.... Well... Honestly I couldn't stop thinking about the moral issues of the situation. The clones were all sentient as far as we could understand. Maybe if they'd made some effort to communicated that the clones weren't actually alive, but only mimicked the creator... But they didn't. So instead, we have this whole scene where perfectly sentient, aware life forms full of curiosity and joy get zapped to death by twilight's magic because of the tiniest slip-up. Twilight even has sort of a diabolical grin. It's.... really very odd. You can never have enough Pinkie. That is all. That really was bizarre. The way that it was hidden behind a horse shoe implied that it had something to do with luck... And it was extremely lucky that they found it just then? It makes me wonder if it'll ever show up again or whether it was a one-time thing. 'Cause, I could picture it going either way. I mean, a strange old tome that shows up when it's lucky to find it and luckily happens to have exactly what you're looking for could make a decent idea for a Twilight episode to center around. It kind of makes me think of the Room of Requirement from Harry Potter. Re: S3E03 - "Too Many Pinkie Pies"
I laughed so hard when this happened, just FYI. Luckily I didn't watch the show at 3am when i normally do, I would have woken someone. Aaaargh! PUT IT AWAY! What did we ever do to you?! *cough* I like the vintage pony style, but in the context of the show that's some freaky scene. Not quite as horrifying as those hoof-fingers though. Brrrr. As for the whole horseshoe door thing, I wouldn't read too much in to it. The script probably called for the book to be stuffed in a "hidden compartment" - basically to give Twilight something to fret over, and to pad out the episode a little. I could be wrong... Also, while we're at it, the horeshoe is upside-down, which is pretty much the universal symbol of bad luck. That was pretty hilarious. Both in the moment as a surprise visual gag, and also as a sort of meta-comment about how much some of us (at least, I did) hated how the current generation of ponies looks back when they were first introduced -- and, yet, now, the older generation LOOKS DEEPLY, DEEPLY, DISTURBINGLY WRONG when it shows up for a fraction of a second inside the show. Very trippy. Very neat. More-so, i think it's an acknowledgement of how horrible and creepy the 3.5 design was. For me there was nothing creepy about a swarm of pinkies... Just obviously destructive. But then, I never read Cupcakes or anything and don't think Pinkie would ever hurt anyone on purpose. As for their destruction, I think they could have emphasized this a bit more but the fact that they were sent back to the pond seems to indicate they were entities taking on Pinkie's persona magically. But then, removal of that persona still constitutes destruction of a sentient entity IMHO. I didn't find all the Pinkies creepy because I thought they'd hurt anyone. (I haven't even heard of Cupcakes). It had more to do with the fact that it was unclear to what degree they were fully sentient individuals of their own or just some sort of shadow mimic creation... Either way comes with slightly troubling implications. One way, there are a lot of not-quite-Pinkies around, and that's sort of creepy, because things that are almost but not quite someone that you love are creepy. That's the whole concept behind all the Invasion of the Body Snatchers movies. Also zombies in general. If they are all fully sentient individuals... then it's troubling when all but one of them is destroyed at the end. In most fiction copies are always nerfed, Naruto and Agent Smith being on the short list of exceptions. If they worked fine, I say copy Celestia next time a god level threat shows up. Copying Celestia to fight off a super villain sounds like a great idea. I'd love to see that. The first thing I'll say is that I'm SO glad that I got to watch this episode with a group of bronies at MFF. I think that in general, it's more fun to watch these with other people anyhow. But we had, what, 15-20 people crammed in one hotel room to watch it on Sunday night. Given the nature of this particular episode, it worked especially well for watching it with a group. I'm still a bit torn on whether or not it was past that line of 'too many nods to the fandom'. And this is probably why it worked so well for watching in a group setting. The reactions from everybody else just helped make it that much better. Had I watched it by myself, I'd have probably been a little more put off by some of the things they did. The biggest take-away I got out of it is that it seems that Pinkie somehow has some family backgroud that dealt with either superstitions or spells of sorts, despite not being unicorns (or as we learned in the past, she easily could have unicorn ancestors, too). I'd put it in a similar place to the sort of spells/sorcery that Zecora is capable of. 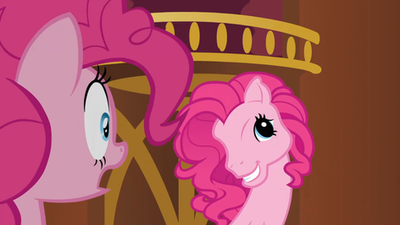 It kinda explains some of Pinkie's Pinkie-ness. As others have stated, I'm curious to see how the new writer handles episodes that might be a little more down-to-earth. Only time will tell! And listening to my "OMGWATWATWATWATWAT" when the first clone shows up. The biggest thing I noticed was RD being called Dashie. It was just..odd to me. That's really a fandom thing. 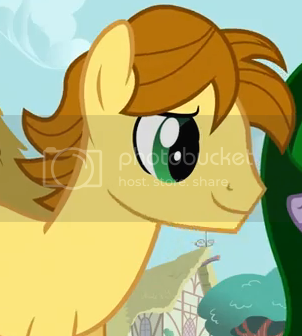 Also, reverse MandoPony showing up. The minute the animators start putting 'celebrity' OCs on the show, I'm calling it quits. Watch as I work my Gypsy magic! Eye of the newt and cinnamon! Watch as the matter turns to batter! Open the portal, jump in!